Ah sweet, sticky honey. A liquid gold of sorts; a food of the gods. While there are hundreds honey types in circulation globally, we in little old New Zealand are world-famous for one in particular - the queen (bee) of honey, and ever popular, mānuka. Mānuka is a monofloral honey (meaning honey made from the nectar of one plant). It’s produced from the mānuka tree, aka Lepotospermum scoparium, which is indigenous to New Zealand and strongly intertwined into Maori traditional and natural medicine (Te Papa, 2019). Looks wise, it’s markedly viscous, or thick; with a goldenly amber colour. It has a characteristic aroma that’s a mix of nutty, damp and earthy; and is, of course, sweet - but with a slightly bitter aftertaste. 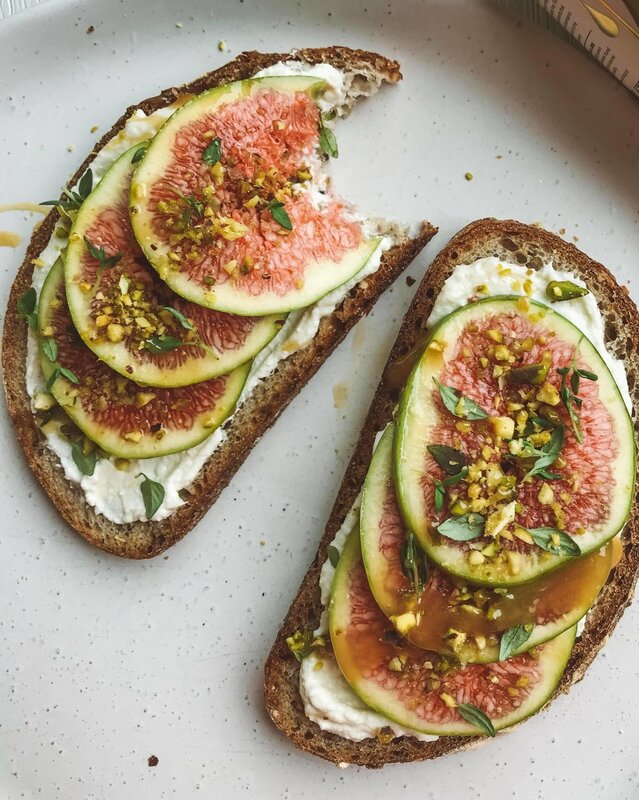 In the kitchen, spread it the classic way on toast, sure. But it can also be used in baking to both sweeten and add depth of flavour (simply sub ½ cup honey for 1 cup sugar); added to drinks, like a hot lemon and ginger over winter; used to balance marinades and sauces; or even just enjoyed as a sneaky teaspoon direct from the jar. We’ve allllllll done it. Of course, honey, like all concentrated sugar sources, is a food to consume sparingly, or in smaller amounts. This kind of goes without saying - when we buy a jar of honey, it’ll naturally last on the shelve for a while. Yet, mānuka has a slightly different reputation regarding potential health benefits, supported by quite an extensive range of scientific studies. There is lab-based evidence, for example, to suggest it efficiently inhibits influenza virus replication (Watanabe, Rahmasari, Matsunaga, Haruyama, & Kobayashi, 2014). This highlights the perceived antimicrobial properties of this unique product - even used effectively in wound dressings! (Watson, Bergguist, Nicholson & Norris, 2017). Total kiwi honey exports now top $350 million/year, and is one of our fastest growing exports at 19% per annum over the past 10 years. Of this, the industry suggests mānuka accounts for 70-75% of the total value (Williams, 2018) - that is a *seriously* huge honey pot. However, this takes us into a sticky situation - while the annual production of genuine New Zealand Manuka honey is approximately 4000 tonnes (Puriti, 2019); according to research by UMFHA, the main trade association of NZ mānuka honey producers, some 10,000 tons is being sold internationally and marketed as mānuka honey (Leake, 2013). Which leads to a conundrum where the maths doesn’t quite add up. Lepotospermum scoparium in all of it's glory. Every product has a story before it winds up in our shopping basket - where it has come from and how it was produced? This story can be a powerful impactor and driver of food choice, evoking the question why buy what we buy? Quality? Ethics? Community? Nutritional benefits? Provenance help us explore all this, and then make a more considered choice over the products we buy, and therefore align with. Knowing the provenance of food isn’t always black and white though, but rather many shades of grey - there can be a heck of a lot of public confusion around what makes New Zealand Manuka honey unique. So, on a global scale and given mānuka honey isn’t always mānuka honey, provenance and purity is key. HOW DO WE THEN KNOW WHETHER MANUKA IS REALLY MANUKA? NZ’s Ministry for Primary Industries (MPI) has given us a hand here, by finalising a government-set robust, and rather sophisticated, criteria and scientific testing methodology late 2017 around what makes mānuka honey indeed mānuka honey, which can be used to authenticate products specifically for export; along with ways of improving traceability (Ministry for Primary Industries, 2019). In short, this allows the right people to call mānuka, Mānuka! Product labelling criteria and legal requirements differ outside of NZ. If a product is to be labelled true mānuka from NZ, it has to pass through MPI-recognised laboratory testing; which by definition, and getting rather technical, must contain a combination of five attributes (four chemicals from nectar and one DNA marker from mānuka pollen). This standardisation is important as it allows the industry to separate true NZ mānuka honey from other honey types (Ministry for Primary Industries, 2019). Beyond this, if you pick up a jar of mānuka you may notice UMF and MGO certifications on the products labels. These measure and grade honey’s purity and quality, through a separate industry led standard. UMF is internationally registered, and can only be used by licensed users. These guys seek to identify natural and unique markers, like Leptosperin, Methyglyoxal and DHA - found natrually in mānuka honey produced on our home turf. The presence of certain compounds are graded to allow a comparison of the honey’s bacteria-killing power against that of a standard antiseptic. As the rating on the jar increases (e.g. UMF10+ UMF 12+, UMF 15+…) as does the antibacterial power (Williams, 2018) . So, if in doubt - look for these marks too! Honey contains around 80% sugar (as natural glucose and fructose, rather than sucrose found in table sugar) and a unique combination of other compounds - including antioxidants like flavonoids and phenolics - suspended in water. High levels of compounds such as methylglyoxal (MGO) have documented antimicrobial activities, which is what makes genuine mānuka honey so special (Williams, 2018). It’s sweeter than white sugar, but with a smidge less calories, and contains naturally occurring vitamins and minerals. Every jar of ‘PURITI’ is packed at one source and protected by at least 11 separate anti-counterfeit security measures - so you’re getting what the jar says you’re getting! PURITI is the only brand to have both UMF and MGO certifications clearly shown on all labelling and packaging. PURITI MGO levels are significantly higher than the UMF minimum requirement and apply to all products sold within New Zealand and not just for exported products. Although the MPI Manuka honey Science Definition does not apply to mānuka honey sold within New Zealand, PURITI has voluntarily adopted test standards at a level 10% - 100% higher than the export standard - which is impressive! Genuine mānuka honey is a rare, unique commodity to NZ. When buying a jar, and in an attempt to safeguard mānuka’s purity, make sure your honey pot has been harvested, extracted, tested, certified and packed in the country. As you probably now can see - being ‘produced in NZ’ isn’t enough. Toast your bread. While that’s on whisk into the ricotta the grated zest of the lemon and squeeze 0f lemon juice. Add the manuka honey and mix again. Taste test and adjust to your liking - add more honey, lemon, ricotta, whatever! 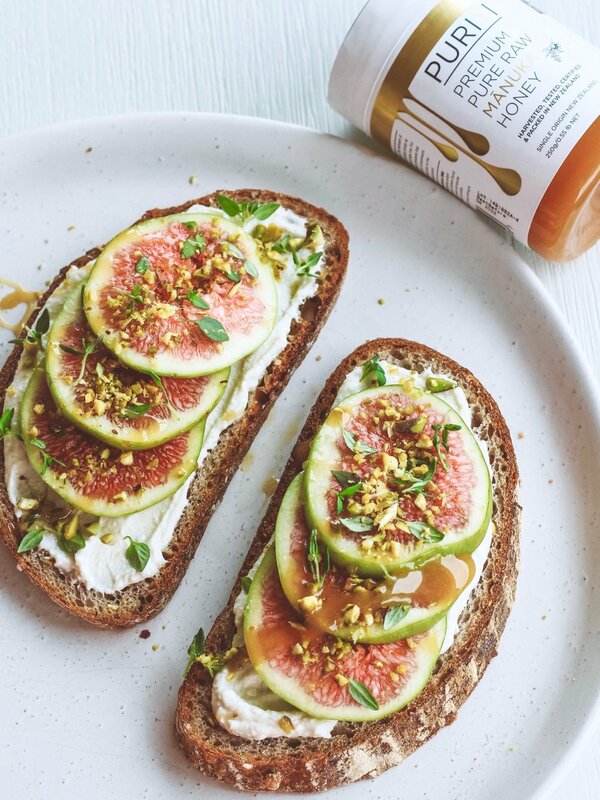 Once happy, spread the honeyed-ricotta onto the toast, top with sliced figs, a few thyme leaves, chopped pistachios and an extra drizzle of honey to tase. Thank you with Puriti for supporting me to put together this article! While Puriti have sent me their products to trial out, as always all opinions are firmly my own. Watson, D., Bergguist, S., Nicholson, J., & Norrie, DH. (2017). Comprehensive In Situ Killing of Six Common Wound Pathogens With Manuka Honey Dressings Using a Modified AATCC-TM100. Wounds. Jonathan Leake (26 August 2013). "Food fraud buzz over fake manuka honey". The Times (London). Archived from the original on 2013-09-15. Williams, C. (2018 ). Manuka honey - market insights. My Farm Investments.